There is free traffic after the bottleneck, although there the traffic flow is higher since the road must accommodate the onramp vehicles as well. The example video (3.3 MB) starts with the driver's perspective. You encounter a traffic jam without obvious cause ("phantom jam"), or stop-and-go traffic, and you might ask, why all the drivers of the front vehicles brake at all. 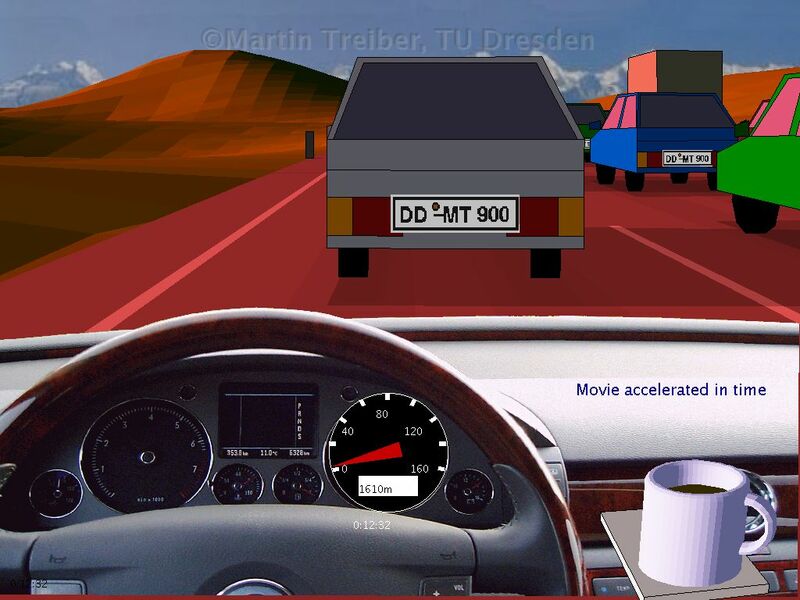 Notice that, besides the ordinary speedometer, the virtual vehicle is equipped with a Coffeemeter sensing the "ruggedness" of the driving style: After abrupt acceleration, braking, or lane-changing manoeuvres, the coffee spills over. Unlike real coffee in real cups, however, our coffeemeter refills itself as soon as a sufficient quantity of coffee is spilled. In addition, the spilled coffee and the coffee stains magically clean up themselves after some time. 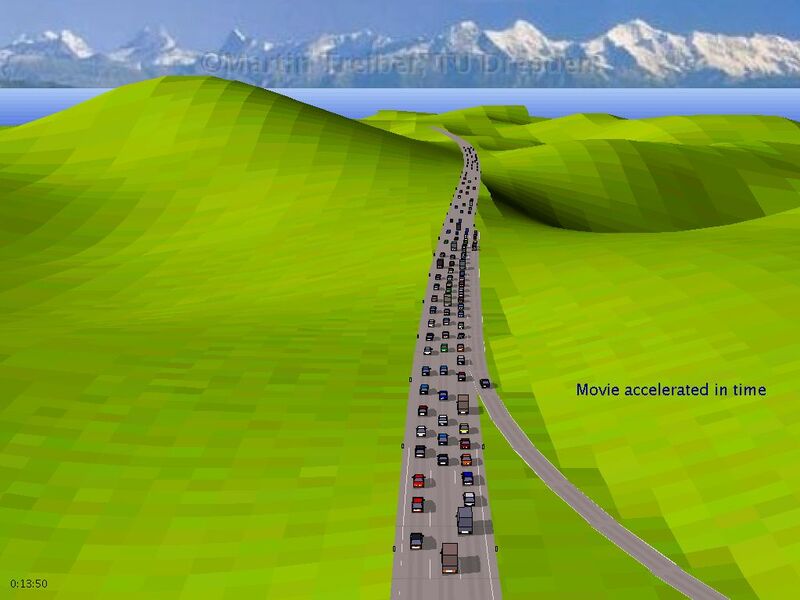 After some time, the perspective in the movie switches to the helicopter perspective (6.7 MB) (it would be nice to do this in reality!). Now you see the on-ramp acting as bottleneck and causing the phantom jams and stop-and-go waves. Finally, the Bird's eye perspective (2.2 MB) focusses on the situation near the ramp. Notice the stationary downstream front of the congestion, and the dissolution of the jam downstream of the ramp. In this simulation, the merging zone is implemented in a very crude way which sometimes leads to a rather unrealistic lane-changing behaviour from the on-ramp to the main road. After some time, the vehicles move on: One may wonder what caused this stop? Or was this an example of the infamous "phantom traffic jam"? After some time, we stop again, then go again. It would be too nice to get an overview of the situation! Therefore, we rise and assume the perspective of an helicopter. Finally, we see the reason for this traffic situation: Disturbances of the traffic flow caised by merging manoeuvres of vehicles entering from an on-ramp! After having passed the on-ramp, traffic flows freely again! This is the same situation as in the driver-helicopter movie above, only we remain in the driver's perspective all the time. We start approaching a traffic jam at daylight. On the way through the stop-and-go waves, we encounter a foggy situation with bad visibility down to 40 m.
Afterwards, we encounter dusk, then darkness, wetness, and sometimes bad visibility conditions in various combinations.